During the election year, the Pew Research Center for The People & The Press frequently polled public attitudes about the media. In an October 15, 2000 report, the group found that most voters 'generally believe the media has been fair to both major presidential candidates, but more say the press has been fair to Al Gore than to George W. Bush.' In fact, the vast majority of respondents (89%) agreed that reporters' political views often or sometimes influenced the coverage. When asked, 'How often do you think members of the news media let their own political preferences influence the way they report the news?' 57 percent said 'often,' and another 32 percent said 'sometimes.' 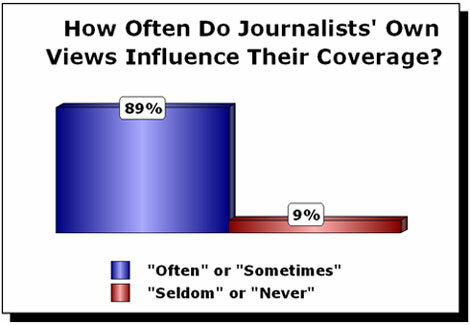 Just 8 percent said 'seldom,' and only one percent thought reporters' preferences 'never' influenced their coverage. Nearly half of the public (47%) thought reporters wanted to see Democratic candidate Al Gore win the 2000 election; just 23 percent thought reporters were hoping for a victory by Republican George W. Bush.